Invite a child to come by telling them you have something to show them. 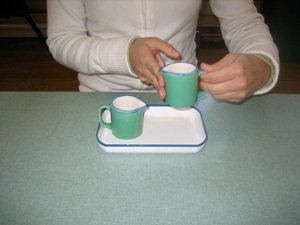 Have the child bring the appropriate tray and have them place it on a specific spot on the table you will be working at. Have the young child sit down first, and then you sit down. Tell the child that you will be showing him how to pour lentils from one jug to another. Wrap your right index and right middle finger through the handle of the jug that is on the right of the tray. Place your right thumb on the top of the handle. 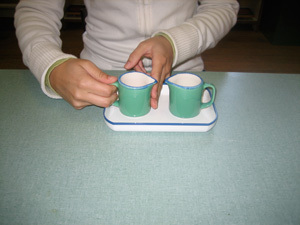 Place your left index finger and left middle finger on the same jug under the spout, in the middle of the jug’s height. Pick up the right jug so the base of this jug is at the level of the other jug’s spout. Bring the spout of the jug in your hands to the center of the opening of the left jug. Tilt the jug slowly in a continuous and steady manner. Continue this movement until all the lentils have been poured into the left jug. Once they are all poured, tilt the jug just a little more and check by moving your head for any lentils that may still be at the bottom of the jug. Bring the jug into the erect position. Replace the pouring jug in its original spot. Lift your two left fingers off of the jug. Wrap your left index and left middle finger through the handle of the jug that is now the full of lentils. Place your left thumb on the top of the jug’s handle. Place your right index finger and right middle finger on the same jug under the spout, in the middle of the jug’s height. Pick up the jug so the base of this jug is at the level of the other jug’s spout. Bring the spout of the jug in your hands to the center of the opening of the right jug. Continue this movement until all the lentils have been poured back into the jug on the right. Once all the lentils have been poured, tilt the jug just a little more and check to see if any lentils have still not fallen. Replace the jug in its original spot. Lift your two right fingers off of the jug. Lift your left thumb and unwrap your two left fingers from through the jug’s handle. Pick up the right jug in the same manner you did when picking it up when you were beginning to pour. Lift the jug off the tray and place it directly above the tray. 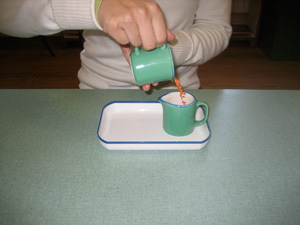 Pick up the left jug in the same manner you did you were using it to pour. Check for any lentils that may have fallen on the tray. If there are a few lentils, use your right thumb and right index finger by pinching them together to pick up any loose lentils. Replace the left jug and then the right jug, picking them up one at a time in the same manner as above. Offer the child the opportunity to pour from one jug to another. Once the child has been successful, offer him the possibility of repeating the activity on his own. Once done, the child should replace his work in its location of the shelves. Pouring with both jugs in the air. Direct: To assist the child in developing the skill of pouring. Indirect: Preparations of the fingers when picking up spilled lentils. Seeing that all the lentils are transferred. 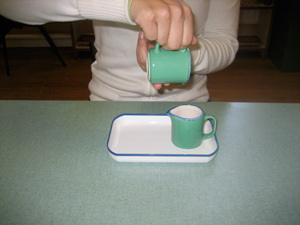 This Montessori Video shows how to present a child with pouring grains.